I have a niece with low-vision who plays the baritone clarinet. If you want to see an approximation of what being legally blind is like, take a look at http://www.acbvi.org/albums/Vision/slide11.html. The solutions for her reading music are few and very expensive. A large screen music reader goes for $4k! Doing a little research, I game across a system put together by Tom Green. It combined foot pedals with the $600 Finale music notation software. 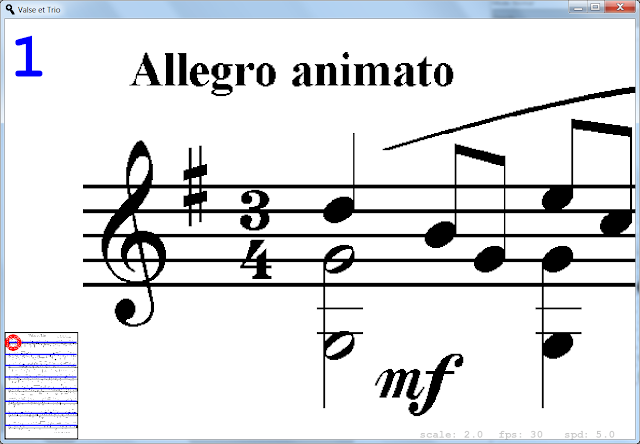 What does "allegro animato" mean? "Comfortably fast", which is how I would describe the development of the this program. Or maybe "quick" and "easy". Amazingly, it is only about 600 lines of Python code. It is not perfect, but I'm pleased with how it turned out. I love my hobbies, and if I can use them to help someone else enjoy their hobbies, all the better! I'll share it with anyone that want to use it. So that would be $0.00 if you already have a laptop, $30 if you add pedals. Send me an email. how can i obtain the software for MagniPy: A low vision music reader ? Hi, my son has keratoconous and plays the drums. I am looking for a system like this - if you could share it I would be very grateful! Please send me an email (see my profile). I have an adult who is visually impaired & a military wife & mother of 4. She stuggles daily with all her activities and still wanted to learn piano! She is trying very hard but is getting a bit discouraged because she has to lean forward almost to the music to see the notes and still has to write what the note is to play it. I found the Lime Light magnifying system but that is clearly too expensive for their family. How can she get your program & how much is it? It looks like it might be helpful for her to be able to play the piano! I have a powermac laptop installed with the most recent operating system. Could I adapt your program to a mac? Thanks.